On Saturday 6 March 2010, the Rwandan authorities confirmed the arrest of the opposition leader, Déo Mushayidi. Mushayidi, had been living in recent months in Tanzania, was arrested by Tanzanian police in the town of Bukoba. On 4 March, he was taken to the Burundi frontier and transferred by the Burundian police to Bujumbura. On Friday 5 March he was extradited to Rwanda, despite the absence of an international arrest warrant or even any kind of legal procedure, and transferred to Kicukiro police station, Kigali. Born in 1961 in the south east of Rwanda, Mushayidi was a genocide survivor who in 1995 resigned his post as assistant to the Secretary-General of the FPR, Major Théogène Rudasingwa. He became a journalist on several papers e.g. l’Ere de Liberté, Imboni where he began to denounce human rights violations and corruption. In 1996, he was elected president of the Association of Journalists of Rwanda (AJIR). He also became Executive Secretary of the Centre for the Promotion of Freedom of Expression and Tolerance in the Great Lakes Region. In 2000, persecuted and slandered by the government media, he requested and was granted asylum in Belgium. There he involved himself in a number of political movements including the monarchist Alliance for Democracy and National Reconciliation (ADRN), Igihango and the Intwari Partnership in order to create in 2008 the Pact for the Defence of the People (PDP) of which he remains president until today. He left Belgium in order to continue his political activities closer to Rwanda. After his arrest, Déo Mushayidi was accused of being implicated in the grenade attacks and of working with Kayumba et Karegeya. Amnesty International has organised an emergency action to support him. As Rwanda Faces Elections: Open Debate In a Closed Political Context? Open debate in a closed political context? Rwanda is not accustomed to open debate. Over the years the Rwanda Patriotic Front (RPF), the party which has been in power since 1994 has built up a control over public life (including the political and judicial organs) on the lines of a one party system despite the existence of a number of other satellite political parties which operate on the fringes of power thanks to their basic loyalty to that power. The electoral cycle (2001 – 2003) which marked the end of the transition period was organised with no open debate: the only opposition party, ADEP-Mizero, was never registered, and the main independent candidates for the presidential elections were disqualified just before the vote. President Kagame won his elections with a stalinist 95% of votes following a campaign marred by the disappearances, arrests and intimidation of voters, candidates and observers. The European Union found irregularities and serious fraud in both the legislative and presidential elections of 2003. The EU observation mission had similar findings during the legislative elections of September 2008. Although the wording of the report and in the declarations made at the time of its publication was very diplomatic and tried to avoid confrontation with the Rwandan régime, several of those who took part in this mission reported voting irregularities, in the handling of ballot boxes and in counting votes. It is now four and a half months until the presidential elections due on 9 August 2010. The ruling party is taking them very seriously and making preparations, putting the party machine in order at local and national level and using all available means including its monopoly of the media. At the same time other political groupings are preparing themselves too. They are trying to obtain registration as political parties and demanding a fair chance to make themselves known and heard by the electorate. * The Parti Social Imberakuri, (PSI) with Bernard Ntaganda as President, formed by ex-members of the Parti Social Démocrate (PSD) which they left because they were frustrated that the PSD remained tied to the FPR. * The Democratic Green Party, with a leadership drawn mainly from the Anglophones, is seen by many as an expression of discontent from within the FPR. Its President is Frank Habineza and its Secretary General Charles Kabanda, one of the founders of the FPR in the 80’s in Uganda. * The FDU-Inkingi whose President, Victoire Ingabire, returned in mid-January to stand as a presidential candidate after an absence of 17 years. The regime does not consider that these parties enrich Rwanda’s political life. In 2009, the Parti Social Imberakuri tried to organise four congresses. Three of them were stopped by the regime for procedural reasons but one was held in June. The PS Imberakuri was recognised as a party in July 2009. Throughout this period the party president, Bernard Ntaganda, made very critical speeches on a number of social, political and judicial issues of concern to the people. For many Rwandans the fact that the regime was apparently allowing Ntaganda to speak so openly was an indication that there could be positive change and a new political openness. In the end an offensive against Bernard Ntaganda was launched from within his own party. The Secretary General of the PSI, Noel Hakizimfura, accused his president of « divisionism and genocidal ideology ». In February Hakizimfura and another party member were expelled from the party for having accepted money from the FPR in order to destabilize the PSI. On Tuesday evening 16 March 2010, some leading members of the PS-Imberakuri were taken to the headquarters of the FPR where they were ordered to organise a party convention the following day, 17 March, to remove Ntaganda from his post. 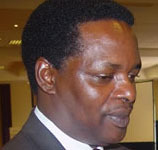 The convention was held and the party vice-president, Christine Mukabunani, declared afterwards that Bernard Ntaganda was no longer president of the party. As a result the institutional framework of the PSI has become very unclear. In her case, Victoire Ingabire had for a long time been preparing her bid for the presidency of Rwanda from Holland where she had been living for 17 years. Ingabire arrived on Saturday 16 January in Rwanda: “I am ready to canvass for my candidature for head of state and victory is certain”, she declared soon after stepping on to the tarmac at Kigali international airport. Her candidature and her direct way of speaking immediately caused tension within the regime which responded with immediate verbal aggression including in the media. Almost immediately she went to place flowers at the Gisozi Memorial. In part of her speech she said: “The road to reconciliation is still long. This memorial only commemorates the genocide perpetrated against the Tutsis, whereas there were also massacres of Hutus “, clearly alluding to the crimes committed in 1994 by members of the former Tutsi rebellion by the Rwandan Patriotic Front (FPR), now in power. “The Hutus who killed Tutsis must understand that they have to be punished. It is the same for the Tutsis who have killed Hutus.” This declaration caused fury on the part of genocide victims, the media and the authorities who accused her of propagating “negativism”. Since 10 February she has regularly been summoned by the police for investigation which has been very time consuming and has hindered her other activities and in which she has been accused of spreading “genocidal ideology, divisionism and contact with the FDLR”. Up to now no formal charges have been brought but a legal framework has been created which can lead to charges simply by transferring the police file to the courts. At the same time the FDU-Inkingi was trying to organise its constituent assembly. On 13 March, she received a letter from the communal authorities which forbade her to organise political meetings since she was subject to police investigation i.e. the February police interrogation was being used to prevent her exercising political rights today. She wanted to react by holding a press conference but all the hotels where she had booked a meeting room were threatened and cancelled the booking at the last minute. The newest opposition party is the Green Democratic Party, launched in August 2009 in Kigali, with the aim of creating a genuine and broad-based opposition with a progressive and ecological vision. This party has also been stopped several times in its efforts to organise its meetings. Faced with this situation, the three parties mentioned have set up a common structure (Conseil de Concertation Permanent des Partis de l’Opposition) in the hope that this coordination will enable them to widen the democratic “space” by having a common position on certain subjects and joint lobbying nationally and internationally. * The creation of a legal framework in which proceedings can be brought very rapidly and where the opposition finds it hard to defend itself (since accusations of spreading genocidal ideology and divisionism are very broad and not clearly defined in law. * An administrative policy which aims to prevent opposition groups being registered, setting themselves up, organising meetings or making themselves known to the general public. In this way two of the parties mentioned above have not yet been registered, while the third has not been given the right to organise activities on the ground. * Infiltration of opposition parties in order to destabilise them from within. These strategies do not necessarily imply that the regime wants completely to ban the opposition. It could easily have done that before. Perhaps it wants first to slow down the opposition, to stop it getting through to the people with a message different from its own and to stop it gaining credibility. The opposition leaders I have met fear that the government will prevent them getting registration in March. The process cannot go forward in April, the month when the country is loaded with emotions, with ceremonies and activities commemorating the genocide. This would mean starting again in May. If the authorities use the same delaying tactics it is not unlikely that opposition political parties would only be recognised several weeks before the elections. In this case they would take part in the elections without any normal preparation for the campaign or for the vote and without a chance of getting through to the electorate. I visited Rwanda during the second week of March 2010. In recent years I have often passed through this country which I have been visiting since 1997, usually in transit to Goma, Bukavu or Bujumbura. Each time I have taken advantage and met some personal or professional contacts, but since 2007 I have never stayed more than 24 hours. I have, of course, always kept up to date with what was happening in Rwanda and, together with my colleagues at EurAc, I have made a continuing effort to provide information to understand the issues better and to discuss them objectively. Such a « leitmotiv » is relevant everywhere but it is especially important in the case of Rwanda: here very often the arguments between “believers” and “non- believers” are like the deaf listening to the dumb. In the weeks just before my arrival it was possible to feel considerable tension building up in the country. Of course we all expected the space for political dialogue to be reduced in the months leading to the election. The demonization of Victoire Ingabire when she returned to the country to lead a campaign for president as the candidate of the opposition party, FDU-Inkingi, led to increasing aggression against the other opposition parties present inside the country. On 19 February, a Friday evening, various well frequented places in the capital were the subject of three grenade attacks at the height of the rush hour resulting in two deaths and several people wounded. The Rwanda media first accused the FDLR, then Victoire Ingabire for these attacks. On Thursday 4 March 2010 in two further, almost simultaneous, bomb attacks in Kigali 16 more people were wounded. These acts of violence were followed by a wave of accusations and arrests. In the time between the two attacks, General Faustin Kayumba Nyamwasa left the country and went to South Africa. After his departure this former Chief of the General Staff of the Rwandan army was accused of being behind the grenade attacks of 19 February and of being associated with the former chief of foreign intelligence, Colonel Patrick Karegeya, who has been in South Africa since 2007. On Saturday 6 March, the Rwanda authorities announced the arrest in Burundi of an opposition activist, Déo Mushayidi, accused by Kigali of being one of the authors of the recent grenade attacks. Gradually the bomb throwers started to outnumber the bombs. You can understand that I did not know very well what to expect. As the days went by I had a problem knowing exactly why the situation seemed to me to be different from what it was the other times I had visited the country. I noticed that the people felt fear, but that had long been the case. I saw a closing up of the political space but this had often been experienced before. I had not remembered grenade attacks in the recent past (but a little research after my return told me that there had been in April and December 2008 and in April and July 2009), but at the same time I had the impression that the grenades were a symptom rather than a cause of events. It was my wish and my duty to bring together all these bits of information in one solid piece of analysis. Finally what was really new dawned on me: I was watching a régime which was primarily not fighting its enemies; it was struggling to prevent its own disintegration. For ten years we had speculated about divisions within the inner circle of power. We always realized that there were disagreements but no-one could help me precisely define these divisions. Today when the régime looks at itself in the mirror it can see the cracks that belie the united and serene image which it wants to show to the public in Rwanda and internationally. The régime has come face to face with its own fragility; it is nervous and is reacting out of all proportion. You will read in the following pages my findings, my impressions and my analysis. This does not reflect EurAc’s official position. It is based on the reflections of a single person and only he is committed by it – a person who, as usual, returns from a visit with more questions than answers. Read further: Open debate in a closed political context? Arusha: France has denied an allegation before the International Criminal Tribunal for Rwanda (ICTR) that a contingent of 60 French soldiers was stationed at Mount Ndiza, central Rwanda, between April and July 1994. In a written request dated February 15, lawyers for former Minister of Youth Callixte Nzabonimana had asked the court to issue a ruling for French authorities to confirm or deny the the allegation made by a prosecution witness on December 1 and 2, 2009. The witness, dubbed CNAL to protect his identity, said he was the French soldiers’ cook at the time of the genocide. Nzabonimana’s lawyers had requested that if France were to confirm its troop presence it should also give the names of the soldiers, the units to which they belonged and the exact dates they were present. The lawyers said they had tried in vain to get the French authorities to confirm or deny the allegation. The judges have not yet ruled on the request, but in the meantime, the ICTR Registrar has received an official note from the French Embassy in Tanzania denying CNAL’s allegations, Hirondelle News Agency reported Thursday. “The Chief of Staff of the Armed Forces and the Directorate of Legal Affairs at the Ministry of Defense have found no documents attesting to the presence of French troops at Mount Ndiza during the period in question,” reads the memo quoted by the court in a ruling dated March 19. The judges found that it is thus no longer necessary for them to rule on the defence request. The French response boosts the attempts of Nzabonimana’s lawyers to prove that CNAL is not a credible witness. The former minister is facing five charges of genocide, conspiracy to commit genocide, direct and public incitement to commit genocide, extermination and murder. He pleads not guilty. According to the indictment, the accused played an important role in the massacres of Tutsis in his hometown of Gitarama (central Rwanda). KIGALI – Rwanda and Ethiopia have signed a Memorandum of Understanding (MoU) in order to strengthen further the defence and military cooperation between the two countries. The MoU was signed on March 25 by the Minister of Defence, Gen. Marcel Gatsinzi and his Ethiopian counterpart, Siraj Fegesa as well as the Chief of Defence Staff (CDS), Gen. James Kabarebe, and his Ethiopian counterpart, Gen. Samora Yunus. The agreement will see the two countries strengthen defence and military cooperation in the area of training and education as well as sharing information on military operations and equipment. Gen. Gatsinzi said that Rwanda and Ethiopia have shared a long history of cooperation in the areas of defence and that the new bilateral deal will cement the already existing ‘strong relationship’ the two nations have been sharing. His Ethiopian counterpart Siraj Fegesa said that his country is committed to maintain the long-lasting ‘sisterly’ relations the two countries have shared and that they will continue to work hand-in-hand to maintain high standards of stability and citizen protection. “When the 1994 Genocide started, Ethiopia was the first country to respond and called upon the international community to react. We were also among the first to send soldiers here to intervene,” Fegesa said. “This shows you that we have had a long history of brotherhood and we believe this MoU will further enhance the mutual understanding between ourselves as well as the mutual benefits that will come out of the bilateral cooperation,” he added. Who is William Nkurunziza, the new ambassador to India? Kigali: The newly appointed ambassador to India, Mr. William Nkurunziza is the man who came under severe criticism four years ago for incompetency from President Paul Kagame and later lost his job. Mr. Nkurunziza was the first head of Rwanda Investment and Export Promotion Agency (RIEPA) – charged with bringing in investments and increasing exports. RIEPA is now part of the Rwanda Development Board (RDB). His job came to the rocks when the appointing authority seemed not to see any tangible results. In February 2006, President Paul Kagame broke his silence. “How will you talk about investment, export promotion, education and other things we intend to discuss here without exploring viable ways of addressing the power crisis we are facing?” he said at the annual closed-door retreat. Saying he was only giving examples, the President made references to several officials namely labour and public service minister El Hajj Andre Habib Bumaya (now exiled), education minister Prof. Romain Murenzi (left country), and the Director General of Rwanda Investment and Export Promotion Williams Nkurunziza, and said that some high-profile leaders were working unacceptably. “However much you, Williams Nkurunziza, might speak good English and be eloquent when talking about export promotion, without electricity you achieve nothing,” Kagame fired. And indeed in May the following year, Mr. Nkurunziza was sacked and replaced with Mr. Francis Gatare at RIEPA. Mr. Gatare is now the Principal Private Secretary to the President. Mr. Nkurunziza was not given any posting after serving at the helm of the investment body for several years. Since then he has reportedly been working in Nairobi. It is hoped that, in the meantime, he has acquired more skills which will allow him to show real performance in his new post as Rwandan Ambassador to India. Sarkozy in Rwanda: another mistake by the French? French Justice considers Paul Kagame and his men as criminals and wants them to face justice (triggering the Rwandan genocide, crimes against humanity, war crimes). French President Nicolas Sarkozy considers now that France needs to kneel down and partner with them. Is that another mistake by the French? Nicolas Sarkozy in Rwanda – February 26, Kigali. South Africa, according to Jacob Zuma, has not yet received an official complaint from the government of Rwanda about the two wanted persons. He however said that if Rwanda complains, the South African government will discuss the issue. President Paul Kagame today commissioned 240 new cadet officers into the Rwanda Defence Force at the Gako Military Academy. In his speech after officially commissioning the new army officers, President Kagame congratulated and welcomed the officers to the Rwanda Defence Force. He also acknowledged the presence of graduates from countries around the region who chose to undergo training in Rwanda at the Gako Military Academy. “I wish to acknowledge your endurance and your dedication to the military institution, motivated, no doubt, by your desire to uphold our countries’ honour and integrity. May I also acknowledge the presence of graduates from our friends in the region and beyond who chose to come and undergo this rigorous training in our country and did well. I should also thank our other guests from our brother and sister country of Ethiopia who are represented here by the Ministry of Defense and Chief of Defence staff”, he said. President Kagame told the newly commissioned officers that the training they had underwent was to prepare them for duties which they would be called upon to undertake as directed by the national command authorities including international peacekeeping operations at defending peace and security. He pointed out that the proper training that they had received underscores the soldier’s mental, moral and physical qualities. “Without proper training, even a large and seemingly powerful force may not have good results in the end in the duties they undertake. Therefore, training -proper training is part and parcel and a priority for any force to be effective and efficient,” said the President, adding that the new officers are now equipped with virtues that foster professional competence, disciopline, personal responsibility, teamwork and mental and physical prowess, qualities he said are critically important. “The training has also instilled in you moral courage, integrity, commitment and loyalty to your cause and comrades and the will to overcome even the most challenging circumstances. Above all, I am sure you will have the heightened sense of service to your country,” he said, pointing out to the young officers that these are the same principles that guided and informed their predecessors who led the country’s liberation and now play a critical role in maintaining the peace and security required for Rwandans’ wellbeing and their social and economic development. President Kagame cautioned that leadership is a matter that should not be taken lightly. He said that while at the national level and international politics leadership is an indispensable factor for good governance while at the military strategic level, leadership often means a difference between life and death, success and defeat, making leadership critical to both political and military success because you may have all the resources at your disposal yet without leadership, all opportunities would be lost. He however cautioned that becoming a good leader is a matter of choice because one may undergo training, spend time learning about concepts of leadership and have role models but in the end, he said, one has to choose between so many things to do and how to do them; to lead with courage, without fear or favour and to lead without compromising on principles for the benefit of the people being served. “We have seen many bad examples in our own country and elsewhere on our continent,” he said. President Kagame urged the young officers and those who are already on the force to maintain the sense of duty and responsibility and keep self-seekers and individuals at bay and stop them from reversing the freedoms, integrity and dignity of the people that were fought for. “In the case of our country, there are many examples as we witnessed people riding on resources and will our country and abused their sense of responsibility out of selfishness. But we should remain that institution and the people who fought so hard to liberate ourselves and be able to uphold accountability and have no apology for anybody who fails the demands of that accountability. “Again it’s a question of choice. We can choose to be those people that hold ourselves and each other accountable and build on that for our people’s social and economic transformation, or we can decide to live as individuals satisfy ourselves by doing things that will disadvantage the people we lead and hence remain impoverished, begging, whipped every day and night by those who provide for you –it’s all a choice! Or fill your stomach by stealing from the public resources, ride on short stories of the past; the liberation that you were part of and flee the country and live on the loot,” the President said, emphasizing that security for all Rwandans will be seen in a combination of factors including defending the national sovereignty and territorial integrity and human security which entails social and economic development, good governance, access to vital services by the people, rights and other freedoms. He alerted the newly commissioned officers on the challenges that lie ahead on the road towards the development of the nation and assured neighbours, friends in Africa and beyond that Rwanda will always seek to work together with them in the pursuit of mutual benefits knowing that all concerned deserve the development and the dignity that comes with it.